Defoliation of trees often occurs in response to abiotic (e.g., drought and cold) stresses, through changes in the expression of thousands of genes operating at different scales. Intense defoliation of rubber trees is observed in Xishuangbanna, SW China and is assumed to mainly be attributable to drought stress. However, this has never been proven, and the pattern remains unclear. 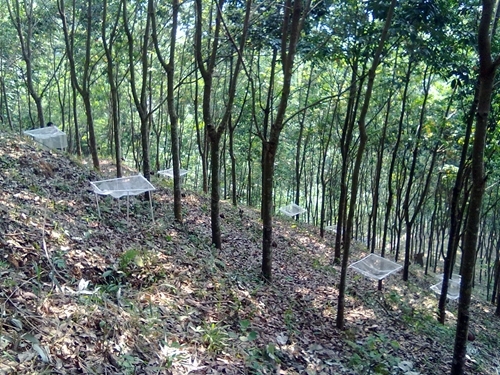 Researchers from Xishuangbanna Tropical Botanical Garden (XTBG) used sap flow and climatic data of four years' (from 2013-2016) observations to explore the pattern and driving factor of intense defoliation of rubber plantations, and to determine the sensitivity of sap flow to climatic factors during the four periods. They found that the intense defoliation occurred in Xishaungbanna rubber plantations was more coincided with period of cold stress, and afterwards t the rubber trees showed weak physiological activities. Sap flow was regulated by physiology in response to environmental stresses but lost its self-regulating ability during the defoliation period after the rubber trees encountered cold stress. Only the sensitivity of sap flow to air temperature recovered to a higher value during the refoliation period after it had decreased to a low value during the defoliation period. Sap flow was mainly regulated by relative humidity, photosynthetically active radiation and soil temperature. "Our results indicated that t the factor limiting the growth of rubber trees and the driving factor of the pattern of intense defoliation occurred in Southwest China rubber plantations were likely the cold stress rather than drought stress", said Prof. ZHANG Yiping, principal investigator of the study. 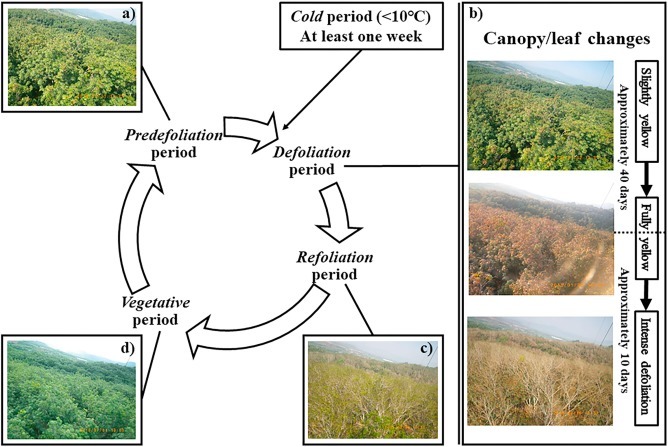 "The rubber trees might enter dormancy after they encountered cold stress during the defoliation period, and sap flow could be employed as an indicator of abnormal physiological activities of rubber trees as well as it was controlled more by physiological processes rather than climatic factors", said prof. ZHANG. The study entitled "Pattern and driving factor of intense defoliation of rubber plantations in SW China" has been published in Ecological Indicators.